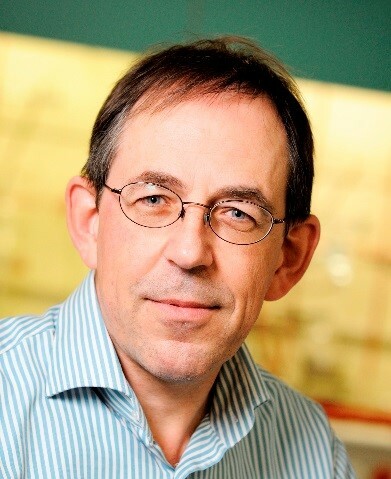 Rene Janssen, of Eindhoven University of Technology, will speak on “Polymer photovoltaics: status and challenges” as part of the 2018/2019 Highlight Seminar Series. Polymer solar cells are advancing in terms of efficiency. They present fascinating opportunities and challenges for scientific research and technological development and have a promise to become a future source of renewable energy. The semiconducting polymers that form the photo-active layer have to fulfil several chemical, optical electronic, and morphological requirements to provide high power conversion efficiencies. After introducing the working principles of donor-acceptor polymer bulk-heterojunction solar cells, I will show how control over chemical structure, intrachain defects, molecular weight, processing conditions, and device architectures are all crucial to unfold the intrinsic limits of these materials. Critical to their efficiency are the length scale and nano-morphology of the donor-acceptor phase separation. Insights obtained by studying morphology formation in real time in combination with theoretical modelling, now enable the rational optimization of the width of semi-crystalline polymer fibers in the bulk-heterojunction that control charge generation. A substantial gain in performance can further be realized using multi-junction solar cells in which two or more photo-active layers reduce losses. By alternate stacking photoactive and interconnecting layers tandem, triple, and quadruple junction polymer solar cells have been developed that exhibit record high performance. These multi-junction can also be used to store solar energy in chemical bonds via photo-electrochemical cells that split water or reduce carbon dioxide. René Janssen is University Professor at the Eindhoven University of Technology (TU/e) in the Departments of Chemical Engineering & Chemistry and Applied Physics. He received his Ph.D. in 1987 for a thesis on electron spin resonance and quantum chemical calculations of organic radicals in single crystals. Janssen has been visiting professor at the University of California Santa Barbara, the University of Angers, and the University of Florida. In 2000, he was co-recipient of the René Descartes Prize from the European Commission for outstanding collaborative research and in 2010 he received the Research Prize of The Royal Institute of Engineers in The Netherlands for his work on Materials for Sustainable Energy. In 2015, Janssen received the Spinoza Prize of Netherlands Organisation for Scientific Research. The research of his group focuses on functional molecules, macromolecules, nanostructures, and materials that may find application in advanced technological applications. Synthetic organic and polymer chemistry are combined with time-resolved optical spectroscopy, electrochemistry, morphological characterization and the preparation of prototype devices to accomplish these goals. In recent years, his research activities have concentrated on organic and hybrid solar cells.